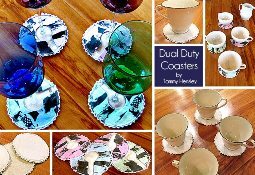 Tammy Hensley from Art, Alphabets, and Adventure shares a tutorial at Sew4Home showing how to make her Dual Duty Reversible Coasters. One side of the coaster is a plain fabric circle, but the other has a keyhole opening so you can slide around the bottom of your stemware. When you pick up your glass, your coaster goes with it. Brilliant! Go to the tutorial.